Simple Sumptuous recipes are back after a long hiatus. Not that I enjoyed the break in sharing recipes, but in the last 6 weeks, I had a good chance to get an insight into what readers are looking for when they look for quality vegan recipes. 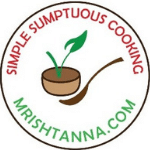 The recipe requests I have received, as well as the comments on older recipes, are all pointing to one major aspect…healthy and animal-friendly recipes. Along those lines is the recipe I am sharing today. It’s one of those salads that you will never find in any store. That’s because it started out as a trial salad. A few iterations later, the salad made its way to the dining table. Moreover, how often do you find boiled peanuts in a salad? Apart from the peanuts, there is a healthy serving of carrots too! If you are not a believer in boiled peanuts, you have to try this first. Cooked corn and boiled peanuts go very well together. Its a quick and easy way to avoid junk food and with the right serving size, this can be a good snack too! 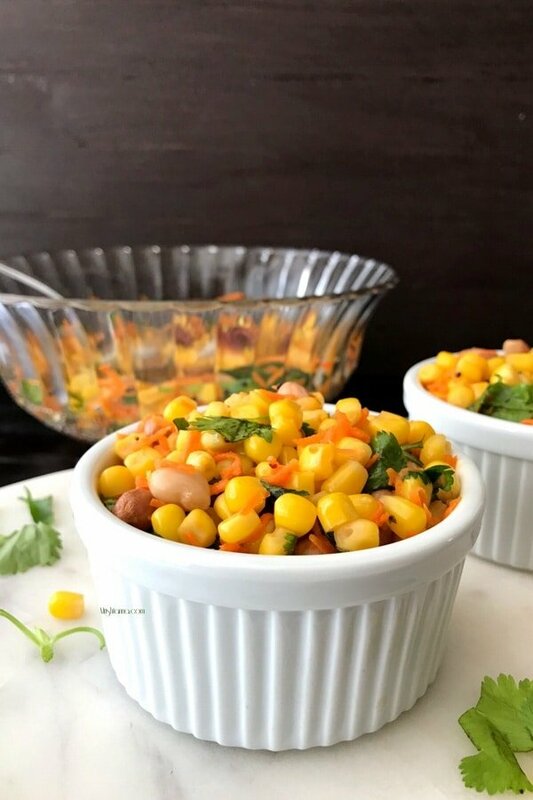 Although I steamed the corn for this recipe, you could very well try them raw. Raw corn tends to be more fibrous than the boiled version, so you could reduce the number of carrots if you’d like. Last but not least, green chilies are optional. If you or your kids do not prefer green chilies, feel free to skip it. The spices from the tempering are sufficient to complement the flavors from peanuts. In some ways, this is similar to the Kosambari recipe that I shared almost 2 years back. If you would like to try this recipe tonight, check out my short video. If you have any questions, feel free to leave a comment here or on my facebook page. For more delicious vegan recipes such as this sent directly to your inbox, just subscribe to my newsletter. You will also get a copy of my e-book where I have put together some simple vegan dessert recipes and dessert essentials. My readers have found it very helpful and I am hoping you will too! 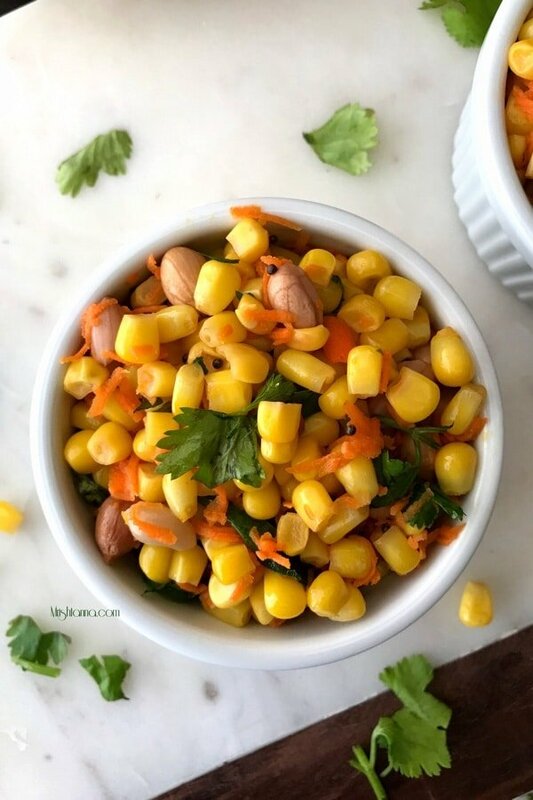 Try this healthy corn salad. Made with fresh ingredients and perfect for any time of the year. Cook the corn and peanuts in a separate bowl. And let it cool. Drain any excess water and mix the corn and peanuts in a bowl. Add carrots, cilantro, green chilies, salt and mix well. To prepare the tempering: place a pan over medium heat, add few tsp of oil. As the oil heats up, add mustard seeds, urad dal, and red chilies. Saute them until the urad dal turns golden. Add curry leaves and switch off the heat. Add the tempering to corn mix. Mix well! 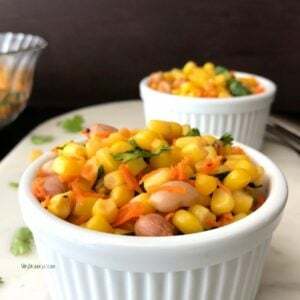 Healthy Corn Salad is ready!